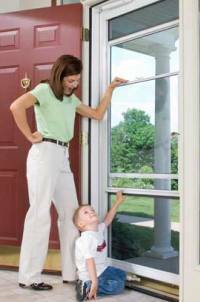 Why Buy Storm Doors From Guida? Our experienced sales consultants will help you design the perfect door for your home by recommending styles and options that will enhance your entryway. We buy our aluminum storm doors from ProVia, which is recognized throughout the industry as a leader in door quality. They take great pride in ensuring every door is made with care. The aluminum storm doors from ProVia are unlike the typical light duty storm doors found at the big box stores. These storm doors are heavy duty and built to last. This heavy duty frame construction adds beauty to your door by virtue of the rounded cove molding along the glass edge of the extrusion. Our bottom expander with sweep allows for adjustment to ensure a snug fit as needed. Varies by model. These finishes are backed by a Lifetime Warranty for lasting beauty and low maintenance. Upgrade your bottom expander and hinges to match your lock with either brass, nickel, antique brass, or aged bronze. Optional mailslot available on select door styles. Solid aluminum construction. Available on select styles.